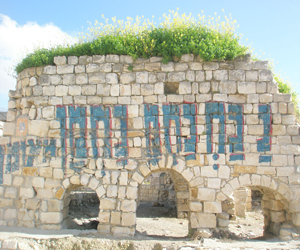 Tzfat has long had an attraction for olim, immigrants, who come to Israel from various countries. The city is relatively isolated from the center of the country, where the nightlife, cultural activities, good schools and employment is located. Yet every year, more immigrants, including quite a few North American immigrants, decide to make Tzfat their home. Sharona* -- Sharona is 42, mother of 3 children aged 10, 13 and 16. She is a stay-at-home mother. Her husband works in high tech, and is maintaining his employment in America by working on-line. She says, "I grew up in a small town in the Midwest and never had many Jewish friends. In my high school, I was one of five Jewish kids in the class. I wanted my children to grow up in a Jewish atmosphere, but we aren't particularly religious, so I didn't want them to feel pressured to "conform". In Tzfat, they go to State Religious Schools, which give them a religious background, but don't coerce them to do things that they don't feel comfortable with.....I think that, in the end, makes them more inclined to explore religion, which is fine with us. For myself, I like having friends from all different Jewish religious backgrounds, and in Tzfat, I don't feel that my friendships are limited because of what I do or don't do religiously." Richard* -- Richard is 50, married and the father of 2 children, aged 12 and 14. He is a doctor of alternative medicine and is slowly building up a practice; his wife taught cooking classes in Canada, and is presently working on writing a cookbook. They arrived one year ago. Richard explains, "I'm from Montreal, but my family is Sephardic (North African/Mediterranean Jews), from Morocco. I wanted to be around other Anglos, because I'm used to it, but I also want my children to be in an environment where there are both Ashkanazi (Eastern European Jews) and Sephardi kids around, because I want them to learn about their culture too. The schools where they learn are mixed and we feel very comfortable here." Malka and David* - Malka and David are in their early 30s, parents of 2 children, aged 2 and 4. Malka is expecting. They are both teachers. They came to Tzfat 2 years ago. David says, "Neither of us grew up in a religious home in America. After we got married, we started exploring Judaism with Chabad (a Hassidic group) in LA. Recently, we started getting involved with Breslev (another Hassidic group) as well. Truthfully, there are some things about Chabad that we like and some things about Breslev that we like. When we decided to come to Israel, we wanted to look for a place where we wouldn't be button-holed into being either "a Breslev Family" or "a Chabad Family" or, for that matter, anything else. We wanted to be able to just be a family that sometimes goes to Breslev, sometimes to Chabad, and sometimes even to do things with other communities. In Tzfat, it's working, so far. My son goes to a Breslev kindergarten, and my daughter goes to a Chabad day care, and we will send her to the Chabad kindergarten next year. I actually like to pray at the Carlebach synagogue, which is neither 'here nor there'. There are other families that do the same thing, and no one thinks anything of it." Every oleh, immigrant, has his or her reasons for choosing where in Israel they want to settle. Tzfat may not be a center of excitement, but for many olim, it has something else -- something different for each, but when it fits, it fits.